On Tuesday, business professionals and organization leaders on both sides of the issues provided background on five statewide ballot initiatives to go to Colorado voters in November. 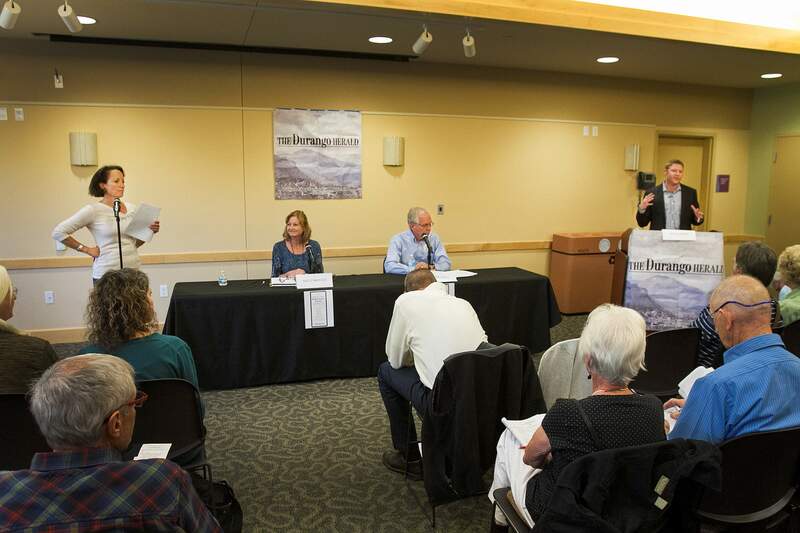 The Durango Herald hosted the forum at the Durango Public Library. Discussion covered some of the most divisive measures, including end-of-life options and Proposition 108, which would allow unaffiliated voters to cast their ballots in the primaries, in which many races are determined. The latter was particularly resonant with some at the forum because in La Plata County, the pool of unaffiliated voters is outpacing both the Democratic and Republican parties. Of the 700 who registered to vote so far this month, 48 percent of them registered unaffiliated, 27 percent Democrat and 19 percent Republican. One proponent and one opponent debated each ballot item. Local attorney Bill Zimsky argued in favor of Proposition 108 on the grounds that it will drive more voters to the polls. But District 58 State House Rep. Don Coram said the proposal would come with confusion over how to vote as well as extra costs to provide party-less voters two ballots. Coram also sounded off on Amendment 71, which would create greater hurdles to amend the state constitution. In Colorado, that process is currently considered to be fairly easy compared with other states. But Richard Moser, a historian of American politics and culture, contended that only powerful corporations with money and influence will be able to push initiatives through. Other initiatives include ColoradoCare, or Amendment 69, which would eliminate private insurance for a 10 percent “premium tax,” as well as Proposition 106. The latter failed to clear the Colorado Legislature for the past two years. If passed, it would allow a terminally ill individual to choose to end his or her life, similar to Oregon’s Death with Dignity Act that passed 20 years ago. Shelly Maycock, center left, and Guinn Unger prepare to discuss Amendment 69: ColoradoCare at a Durango Herald-sponsored forum Tuesday at the Durango Public Library. Arguments for and against initiatives on the ballot this year were presented.